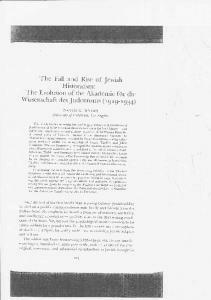 The Fall and Rise of jewish. Historicism: T'he Evolution of, the Akadernie frir clie. Wissenschaft des Judenrums (t g r g-L%4). DA\,'II] N..MYERS. Uniuersity of Ca. 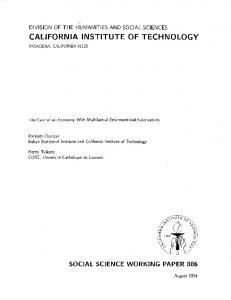 institutions of the German working class movement which breaks down the artificial ... The SPD, founded in 1875, had been the largest party of pre-War social ... developed for the first time into a mass movement, its votes rising from. 2.6% in 1928 to ...... leadership moved increasingly to the right after its entry into government. How could the working class movement split when confronted by the obvious menace of Nazism? 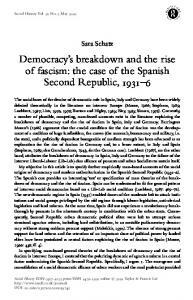 This paper argues that this split, represented by the 'social fascism' line of the European communist parties in the late 1920s, cannot be adequately assessed by a political critique of the workers parties or by a sociological analysis of the composition of the working class . Instead it develops an historical analysis of the formal and informal institutions of the German working class movement which breaks down the artificial dichotomy between 'organisation' and 'spontaneity' . 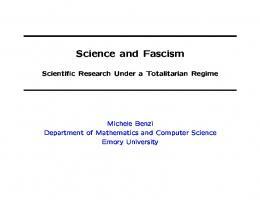 This analysis reveals how the decline of informal class organisations in the mid-1920s created a situation in which the 'social fascism' line could become a self-fulfilling prophecy . ways in which people come together to resist together . Defining the working class movement in this way is important for two reasons . Firstly, it overcomes many of the problems associated with the notion of 'class consciousness' . Not only does it analyse locatable practices rather than imputed ideas, it also overcomes the perennial problem that 'working class' political action never actually involves all members of 'the working class', but nearly always also involves non-workers as well (cf . Hindess, 1977) . Taking the working class movement, and not the working class as such, as the object of analysis dispenses with the problematic notion of class subjects . Secondly, this approach allows us to break down the whole dichotomy between spontaneity and organisation, which is largely the dubious legacy of leninism within marxist political theory . It allows us to grasp the full political importance of Gramsci's claim that spontaneity as such does not exist, and restore to their rightful place everyday organisational activities without falling into theoretical spontaneism . [ 10] However, just as it is important to treat the working class movement as wider than official institutions, it is equally important to delimit it . The working class movement does not include forms of resistance which are either individual, or more importantly, subcultural, nor is it the same as the concept of 'proletarian public' developed by Negt and Kluge . Not only do these authors essentially treat 'public' as an extension of 'consciousness', but the concept is continually treated as including questions of life style, so that the domain of the political is dramatically over-extended . Forms of adaptation and resistance to capitalism such as either the traditional extended working class family or contemporary forms of youth culture may well be actually more of an impediment to the smooth accumulation of capital than a well integrated trade union movement (cf . Hall and Jefferson, 1976), but this 'resistance' is largely 'unconscious' . It does not have the distinguishing feature of a social movement, that of an organised practice orientated towards the achievement of a (however limitedly) different state of affairs . The working class movement, in contrast then to working class culture, involves explicit resistance . As such, despite the rhetoric of its members, it is not the class itself : the world of the working class movement is the world of the rank and file militant attempting to mobilise support for economic, political and ideological change . 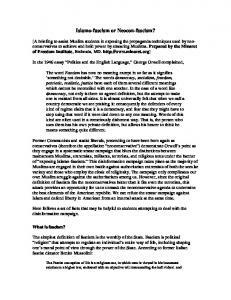 This stratum of militants is variable in a number of ways . 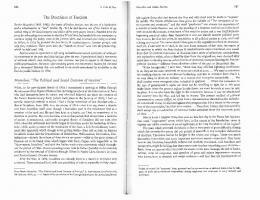 The crucial questions for a materialist analysis of the origins and effects of social fascism concern not just the number and social location of these militants, although this is obviously important, but above all the organisational form of the working class movement which they made up . Firstly, it is necessary to examine the degree to which a unified working class movement existed before the advent of the social fascism line . This is not, it cannot be stressed enough, a question merely of the degree of co-operation between the SPD and KPD at a party level, but of the extent to which it was possible for party militants to co-operate with each other across party boundaries . To the extent that this did occur, what forms did this co-operation take and what was its quasi-institutional basis? Source : calculated from Industr-und Handelskammer Frankfurt a .m ., Jahresberichte (relevant years) . In brackets : absolute figures for 1925 . with the continuing political crisis and (towards 1923) accelerating inflation provided the basis for important political effects of the strong factory organisation within the metal industry . Behind the delegate meetings of the factory workers stood the factory work-forces as an organised political force . Thus it is striking that up to 1923 (but not afterwards) the mass demonstrations always took the form of the workers leaving their factories early and marching en bloc to a central meeting place . Workers who were employed in the metal industry at the time still today stress (perhaps with some exaggeration) the unity and the resulting political power of the work-forces : employers for example did not dare to take any reprisals for political strikes . Although this rank-and-file strength was a constant of the period from the end of the War until October 1923, it was accompanied by decisive shifts in political allegiances . From about 1917 onwards the UPSD was clearly the leading political force amongst the shop stewards of the industry : it was on the basis of contacts between them for example that the party organised the initital seizure of local political power in November 1918 (cf . Sender, 1940, pp . 99ff, Lucas, 1969, pp . 16ff) . Some measure of the importance of the metalworkers for the USPD is indicated by the fact that in the local elections of March 1919 fully 35 of the party's 95 candidates were metalworkers, a proportion never reached subsequently by the KPD, let alone the SPD . During 1919 the local USPD consolidated its hold in the DMV when its candidates won all posts in local union elections, despite a vicious campaign by the SPD complete with allegations of ballotrigging . However, when the USPD split in 1921, all the leading local DMV functionaries rejoined the SPD, and the KPD was never able to subsequently seriously challenge the SPD's control of the union apparatus . While in the period of inflation this made effectively no difference to the power of the factory workforces who were able to force the union into continual militant wage bargaining, this shift did provide the basis for the defeat of 1923 .
tinued to argue that only a local alliance with the SPD could safeguard the city's financial autonomy and so prevent cuts in social welfare . The KPO's strategy in Offenbach stands then in complete contrast to that of the KPD in Frankfurt . While the KPD isolated its own supporters and would not organise them effectively even in this isolation, the KPO was continually concerned to strengthen and move leftwards the working class movement as a whole . This is shown not only in its attempt to compel the SPD to resist (instead of passively accepting) the cuts in social welfare, but more importantly, in its attempts both to utilise existing working class institutions and to create new ones-institutions which could form the basis of a proletarian public. Within one local area then, a different politics to those of the KPD were able to some extent to prevent unemployment from dividing the working class movement . However, in Frankfurt itself, the left within the SPD was unable to make a similar breakthrough, despite apparent favourable conditions . As elsewhere in Germany, in Frankfurt the decisive issue for the left in the SPD was the extent to which the party should form coalitions with bourgeois parties . In preparation for the party's congress in Magdeburg which debated the issue in May 1929 (cf . Hunt, 1970, pp . 228ff; Drechsler, 1965, pp . 40ff), the Frankfurt local organisation had passed a motion critical of the coalition policy and two of its three delegates were opposed to coalition . Significantly, while the bulk of the SPD Frankfurt leadership were full-time trade union or party officials, these delegates-Karl Beul and Andreas Portune-were shop stewards in the DMV and had a personal history which went back to activity in the USPD and the factory committees of the Revolution of 1918 . However, unlike ten years earlier, these same leaders were now unable to develop any real mass basis . For people such as Portune and Beul, the SPD's election losses in 1929 were the deserved result of coalition with bourgeois parties in government, and they proceeded to call a series of party membership meetings to make their point . The extent of discontent within the party in early 1930 is shown by the fact that Portune's motion that the SPD immediately leave the coalition was finally only defeated by 112 to 136 votes . Indeed, the subsequent attempt of the Bezirk (regional) party organisation to counter the growing strength of the Frankfurt left at first misfired, cementing the emerging alliance between the marxist left and other elements within the local party leadership critical of party policy . Determined to break the left's editorial control of the local party newspaper, without any warning the regional press commission dismissed Hans Marckwald, a left-wing member of the editorial committee. This was clearly perceived by nearly all the Frankfurt SPD as an unwarranted step, and their opposition was made particularly vehement by the fact that under the shock of his dismissal, Marckwald and his wife attempted joint suicide . It was Kirchner himself who now led the attack on the regional secretary, Paul Rohle, whom he accused of engineering Marckwald's dismissal . When Rohle appeared at a membership meeting of the Frankfurt party he was hardly able to make himself heard, Kirchner demanded his resignation, and a motion along these lines proposed by Portune was passed by an overwhelming majority . than the version published by Rote Fahne in Berlin, according to which all but a few social democratic functionaries had elected the leadership of the strike, which was only defeated by the violent military repression of 700 armed police (together with representatives of the French and British occupation forces) rampaging in the factory . Nonetheless, the Opel workers themselves were clearly unconvinced by such hyperbole . The RGO had criticised its own works councillors for 'legalistic' tendencies in 1929-now the new 'revolutionary' candidates were severely defeated in the April works council elections, the RGO vote falling from 40% in 1929 to a mere 22% in 1930 . The defeat of the February 'putsch' opened the way for massive repression in the factory . During 1930 work-discipline was continually increased : there was increased use of time-and-motion studies and the first introduction of uniforms, there was instant dismissal for any strike action which was either illegal or against already negotiated agreements, and by 1931, even for bad work-standards . At the same time control over workers' representatives was increased : a new complaints procedure was introduced which obliged all communication between workers and works councillors to be made known to the management ; while the six most senior works councillors were made full-time representatives and paid by the firm, the other councillors were strictly limited to holding only one meeting a month . Not surprisingly in this situation, all attempts by the KPD to revive the wages issue were completely ineffective, and although the party's factory cell still included 50 people, its members were now completely demoralised . On the other side, the SPD and the trade union could only offer a policy of complete passivity . The SPD factory newspaper concentrated almost entirely upon attacking the communists for their alleged incompetence, their utopianism and their deceitfulness, while pointing out the lack of trade union rights in the USSR . As far as conditions in the factory went, the paper could only complain that the work was inhuman and issue vague appeals in support of the trade union . Yet the combination of anti-communism and warnings against hasty action could provide no solution to the increasingly desperate situation in the factory . When in mid-1931 the firm threatened either a further 2,000 permanent dismissals or the complete closure of the factory, the SPD could only argue that it was important that the factory stay open, however few people were left . . . so that at least the works council could remain in existence! The inability of the KPD to even put forward any alternative shows how the party's effective strength in the factory had been decimated, not simply by mass unemployment, but by its own tactics, tactics which were doomed to failure, however attractive and realistic they may have appeared to its own supporters . politics of the party priority over the politics of the movement, the latter indeed being something which to Poulantzas is almost invisible . If the organisation of the movement was decisive in Weimar Germany, it is arguable that it is even more important today . It is at least plausible that the political structures of advanced capitalism are such that it is now impossible for any one organisation to totally dominate the movement, and that any party which attempts to do this is doomed to defeat (here Louis Althusser's comments in Le Monde on the defeat of the French Communist Party in the recent elections are instructive) . Consequently, Marxists must begin to break with the long tradition, inherited largely from Lenin, that treats 'the party' as the sole theorisable locus of political initiative, and equally importantly, begin to reformulate the problem of democracy within socialist organisations . Once we accept the importance of the movement, then the question of socialist democracy is not just a question of inner-party democracy, nor even of commitment to a multiparty situation, but involves an awareness of the location of these organisations within a wider movement . The best guarantee of democracy in formal organisations is that they be located within a strong movement, one which can provide a continual basis for political innovation, if necessary against the established leaderships . In other words, today, even more so than in Weimar, it is the unity, strength and dominant politics of the working class movement, and not the nature of 'the party' in isolation, which form the decisive political questions for socialists. Slid (Russelsheim, 1955) . 29 M . Hammer, Vergleichende Morphologie der Arbeit in der europdischen Automobilindustrie (Basel -Tiibingen, 1959), p . '18 (cited in Roth, p . 85) ; DMV, Die deutsche Automobilindustrie, 1924 (Stuttgart (1924), p . 22 ; idem ., Die deutsche Autoindustrie An fang 1928 (Stuttgart 1928)), pp . 8f. 30 Seherr-Thoss, 1974, pp . 223, 557 ; Adam Opel AG, Verkauf-Statistik, 1976 ; DMV, Die deutsche Autoindustrie Ende 1925 ; DMV, Die deutsche Automobilindustrie Ende 1929; Weigand, p . 29 . 31 In fact Sloan was rather optimistic : the first year in which more than 200,000 cars were produced was 1956 . Cf . also Sloan, 1964, p . 327 . 32 DMV, Die deutsche A utoindustrie Ende 1929, pp . 13ff. 33 Cf. also H . Ludwig, 'Die Arbeitslosigkeit in der deutschen Automobilindustrie', in DerArbeitslosigkeitderGegenwart (Munich & Leipzig, 1932), pp . 121-154, esp . pp . 123ff. 34 In addition to the sources cited above, this account of events at Opel draws on a collection of KPD and SPD factory newspapers in the Stadtische Archiv, Russelsheim . I would like to thank Peter Schirmbeck and his colleagues of the city museum Russelsheim, as well as Wolfgang Ebenloh and Sigi Roth, for their help in gathering material for this section . 35 During the Depression Opel's total sales did not in fact decline as much as those of other German car manufacturers, largely because of its high exports : in June 1931 Opel exported over a quarter of total production, in June of that year producing 77% of all German car exports. Cf. Seherr-Thoss, p . 186 ; Adam Opel AG, Verkauf-Statistik . 36 DMV, "Protokoll der Reichskonferenz der in der Autoindustrie beschaftigen Arbeiter, abgehalten am 23 . Februar in Frankfurt a .M ." (Stuttgart (1930)), pp . 9, 11 . 37 The 'machine breaking' which the social democrats made so much of in fact seems to have basically involved the cutting of the transmission belts which drove most of the machinery from overhead shafts . 38 Information supplied by the then KPD 'Instrukteur' to the Opel factory cell . It is notable that whereas at a meeting in Russelsheim after the strike, a representative of the KPD's central organisation such as Paul Merker could claim that 'the recent events in the Opel works have had a favourable response far beyond the German frontiers' ; on the same occasion an actual participant such as Oskar Muller admitted publicly that the strike had been a defeat . Gollancz, 1945) . Angress, Werner, 1963 Stillborn Revolution : The Communist Bid for Power in Germany 1921-1923 (Princeton University Press) . Bahne, Seigfried, 1976, Die KPD and das Ende von Weimar : das Scheitern einer Politik 1932-35 (New York and Frankfurt, Campus Verlag) . Barbu, Zevedei, 1956, Democracy and Dictatorship : Their Psychology and Patterns of Life (London, Routledge Kegan Paul) . Bologna, Sergio, 1976, "Class Composition and the Theory of the Party at the Origins of the Workers' Movement", in C.S .E . : Labour Process and Class Strategies, pp . 68-91 (London, Stage 1) . Brockhaus, Erhart, 1975, Zusammensetzung and Neustrukturierung der Arbeiterklasse vor dem ersten Weltkrieg (Munich, Trikont) . Caspar, Gustav, 1959, Die Sozialdemokratische Partei Deutschlands and das deutsche Wehrproblem in den Jahren der Weimarer Republik (Frankfurt, Mittler) . Comfort, Richard, 1966, Revolutionary Hamburg (Stanford University Press). Doeringer, Peter, and Piore, Michael, 1971, Internal Labour Markets and Manpower Analysis (Lexington, Heath) . Drechsler, Hanno, 1964, Die SAPD (Meisenheim am Glam, Verlag Anton Hain) . Flechtheim, Ossip, 1968, Die KPD in der Weimarer Republik, (Frankfurt, Europaische Verlagsanstalt) . Gordon, Harold, 1971, Hitlerputsch, 1923 (Frankfurt, Bernard u . Grafe Verlag) ; also as : Hitler and the Beer Hall Putsch (Princeton, 1972) . Grebing, Helga, 1966, History of the German Labour Movement (London, Oswald Wolff) . Hall, Stuart, and Jefferson, T . (eds . ), 1976, Resistance through Rituals : Youth Subcultures in Post-War Britain (London, Hutchinson) . Hindess, Barry, 1977, "The Concept of Class in Marxist Theory and Marxist Politics", in Jon Bloomfield (ed . ), Class Hegemony and Party (London, Lawrence & Wishart) . Holloway, John and Picciotto, Sol, 1977, "Capital, Crisis and the State", Capital and Class 2, pp . 76-101 . Huber-Koller, Rose-Marie, 1977, "Die kommunistische Erwerbslosenbewegung in der Endphase der Weimarer Republik", GesellschaftBeitrdge zur Marxschen Theorie 10, pp. 89-140 . Hunt, Richard, 1970, German Social Democracy (Chicago, Quadrangle) . Jahoda, Marie, Lazarsfeld, Paul, and Zersel, Hans, 1972, Marienthal : the Sociography of an Unemployed Community (trans.) . Regnalt & T . Elsarsser) (London, Tavistock) . Kornhauser, William, 1960, The Politics of Mass Society (London, Routledge Kegan Paul) . Lehndorff, Steffen, 1975, Wie Kam es zur RGO? (Frankfurt, Verlag Marxistische Blatter) . 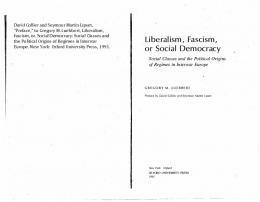 Lipset, Seymour, 1963, "Fascism Left Right and Centre", in his Political Man pp . 131-176 (London, Mercury) . Lucas, Erhard, 1969, Frankfurt unter der Herrschaft des Arbeiterund Soldatenrats 1918-19 (Frankfurt, Verlag Neue Kritik) . 1976, Arbeiterradikalismus : zwei Formen von Radikalismus in der deutschen Arbeiterbewegung (Frankfurt, Verlag Roter Stern) . Lucas, Erhard, Wickham, James, and Roth, Karl-Heinz, 1977, Arbeiterradikalismus and die andere' Arbeiterbewegung (Bochum, Edition Egalite) . Mann, Michael, 1973, Workers on the Move (Cambridge University Press) . 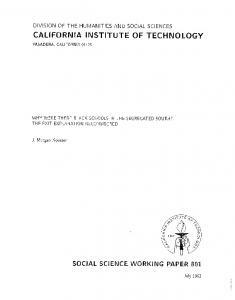 McKibbin, R .L ., 1969, "The Myth of the Unemployed : Who did vote for the Nazis? 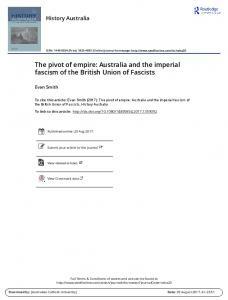 ", Australian journal of Politics and History (August), pp . Gesellschaft-Beitrage zur Marxschen Theorie 5, pp . 257-277 . 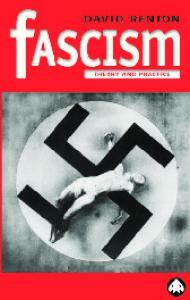 Report "SOCIAL FASCISM AND THE DIVISION OF THE ... - CiteSeerX"